Let Your Kid Soar To The Top Of The Class Or Go “Undercover” This School Year With SuperME By DaphDaph! 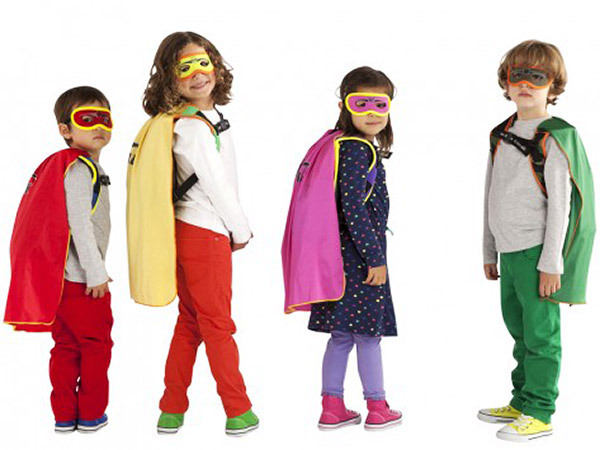 Homework and books won’t be the only thing your little superhero will be pulling out of their backpacks this school year! Let your kid soar to the top of the class or go “undercover” with SuperME by DaphDaph. These sleek and stylish backpacks look super functional from the outside; however, just like a superhero morphs into a different identity, these backpacks do the same with the addition of a hidden cape or hood. This backpack converts into a superhero dress up costume by simply pulling the hidden cape out of a pocket at the top of the backpack. Complete the transformation with the superhero mask that is included. Since superheroes can’t be bothered with umbrellas, there is also a backpack with a built-in hood (both water-resistant). It’s the coolest way to stay dry in the rain! Each backpack comes with a SuperME Velcro patch, which can be personalized with your own hero name or initials. SuperME backpacks come equipped with a MP3 player pocket with cutout for headphone cords, snack pocket on front and a breathable padded mesh backing for comfort. DaphDaph also included reflective buckles for added safety and an adjustable chest strap for better weight distribution. These awesome backpacks are currently available through DaphDaph’s website, www.daphdaph.com, and start at only $29 (with some on sale for $14). Give your superhero the option to either fly through the school season, or go undercover with the one-and-only SuperME by Daphdaph!